CT aims to extend its reach. At RSNA 2017, the major players in CT featured multifunction rooms for interventional procedures, factory-refurbished machines, and other innovations aimed at broadening the use of CT. While the industry has moved on from the slice wars, companies are focusing on a wide range of solution optimizations—from engaging patients with handheld operator panels to spectral (dual-energy) CT to improving coverage, speed, and resolution. Hospitals are being asked to do more with less, so customers are interested in understanding how new advances can help them better diagnose patients and improve outcomes. In addition, productivity, workflow, and standardization solutions are growing in importance. Simplification, automation, and the ability to handle complex patients are key needs that health care organizations are looking to address. Over the past several years, new regulations and associated standards (eg, the Affordable Care Act, MITA SmartDose CT, and XR-29) have prompted the industry to refocus on the patient. As a result, companies are developing unique products specifically designed to improve the patient experience. Despite advancements, radiation dose remains an ongoing concern for CT. From a public health perspective, the vast numbers of CT scans performed daily mean that even modest dose reductions can have a big impact on population health. Greg Sorenson, MD, codirector of the A.A. Martinos Center for biomedical imaging at Massachusetts General Hospital and chairman of the board for IMRIS, says CT users have noted that a number of benefits are associated with XR-29 compliance. "As more CT scanners become XR-29 compliant, more patients are benefitting from dose reduction technologies, and that in turn leads to better long-term health," Sorenson says. "As hospitals have considered what they need to do to bring their CT scanners into compliance with the XR-29 standard to avoid lower reimbursement from Medicare, often they've discovered that there are other features they value, in particular around workflow efficiency." For example, spectral CT is a feature drawing attention. CT innovation typically has a domino effect; when one company develops a technology such as spectral CT, other manufacturers follow suit soon thereafter. As spectral innovation continues to be at the cutting edge of CT, Tom Neufelder, senior vice president and innovation leader of diagnostic imaging at Philips, notes that the industry is seeing adoption of spectral CT across leading facilities as well as hospitals of all sizes. "As the world of health care continues to advance toward value medicine, solutions that enhance diagnostic certainty and the right images the first time can allow organizations to provide better patient experience, enhance clinical care, and achieve their economic objectives," Neufelder says. One example of increased value is surgical CT. To quote the great Yogi Berra: "You can observe a lot by watching." Sorenson says many surgeons realize the truth to this homespun wisdom, noting that having CT available allows them to guide their surgical procedures with more precision. The technology enables surgeons to see where organs, bones, and instruments are located and ensure accurate placement while still in the operating room. The innovation around CT is at one of its greatest levels in years with many of the original equipment manufacturers releasing products designed to improve the already strong modality. Here's a look at what they are offering in 2018. Samsung's latest CT product, OmniTom, is a small-footprint, 16-slice head, neck, and pediatric scanner that can be moved to the patient's point of care. The name speaks to the scanner's omnidirectional wheels that allow for flexible movement in small spaces. "OmniTom has a state-of-the-art data acquisition system that produces high-quality axial, helical, CT angiography, and CT perfusion imaging," says James Sheehan, mobile CT product manager at Samsung. "Utilizing mobile CT at the patient bedside has been independently shown to reduce [ventilator-associated tracheobronchitis] infection and transport-related incidence, as well as increasing radiology outpatient throughput." Samsung customers have been requesting a premium bedside model that increases ease of use for clinicians. "We developed OmniTom to address these needs, including several innovative features such as more slices and overall power, an integrated drive system, and a 40-mm expanded bore diameter," Sheehan says. Matthew Dedman, CT marketing director for Siemens Healthineers North America, says three big trends that the company is seeing industrywide are the use of spectral CT to perform material decomposition—ie, calcium vs iodine—and better characterize lesions; the incorporation of artificial intelligence (AI) in the interpretation of images and to achieve a greater level of standardization and consistency within the scanners; and the reimagining of CT workflows for the technologist. The company introduced four new systems at RSNA this year: the SOMATOM go.Top and the SOMATOM go.All, two new configurations on the SOMATOM go. platform, which was released in 2016; the SOMATOM Edge Plus, a new, premium single-source CT system, which will allow clinical users to cover all CT applications regardless of patient or clinical issue; and a new version of the established, premium dual-source CT system, the SOMATOM Force. Each system is pending 510(k) clearance. "What we're doing with these new configurations is taking the mobile workflow concept and the associated workflow benefits of this platform and enhancing other aspects of the scanner, in terms of generator size, rotation speed, and X-ray tube power, to bring that mobile workflow into the more demanding hospital CT environment," Dedman says. "These new configurations can perform advanced procedures such as cardiac CT and CT-guided interventions; they can handle emergency patients and can offer spectral imaging." Additionally, the company introduced the FAST 3D Camera, which is installed above the patient table and incorporates elements of AI to automatically safeguard precise, consistent patient positioning. The FAST 3D Camera will be available on the company's dual-source CT systems—the new version of the SOMATOM Force and the established SOMATOM Drive—as well as the SOMATOM Edge Plus. "The technologist would use this camera to take a 3D and infrared picture of the patient, from which the scanner could automatically position the patient for the procedure," Dedman says. At RSNA this year, Philips introduced the IQon Elite Spectral CT configuration, offering a new suite of features to enhance the clinical benefits of the IQon platform while further expanding the capabilities of spectral CT in emergency/trauma and oncology care. "Our calcium suppression application allows for better visualization of bone marrow pathology, and the electron density result helps enhance tissue characterization, enabling a new level of diagnostic certainty for oncology clinicians and their patients," Neufelder says. "The Elite's new radiation therapy planning couch and bariatric table top opens the door to being able to scan a wider range of patients." Additionally, Philips' Access CT scanner, which was launched this past year, is designed specifically for health care organizations seeking to establish or enhance CT imaging capabilities at a lower cost. "As health care needs grow across the globe, many health care organizations are increasingly challenged to efficiently diagnose and treat a greater number of patients," Neufelder says. "For cost-conscious health care organizations, a value-focused CT solution such as the Philips Access CT offers the low total cost of ownership and the diagnostic confidence needed to drive clinical, financial, and operational efficiencies." Canon, which purchased Toshiba Medical Systems in December 2016, launched the Aquilion Prime SP, a new mid-tier scanner, at RSNA. "It's an 80-slice detector scanner that has technologies that we developed and launched on our premium scanners last year and migrated down into the mid-tier product," says Tim Nicholson, senior manager of market development for CT at Canon Medical Systems USA. "Specifically, one of the technologies is what we call Pure Vision Optics, so it's a new optics chain that allows for a harder X-ray beam coming out of the X-ray tube for Prime SP. A harder X-ray beam means lower dose to the patient and, actually, lower dose with even better image quality than previously." The new CT scanner allows faster image acquisitions to keep patients as comfortable as possible on the scanner and sends the images as fast as possible to the facility's PACS environment. At RSNA 2017, GE introduced its new NVIDIA-powered Revolution Frontier CT, which is two times faster in imaging processing than its predecessor, due to its use of NVIDIA's AI computing platform. The Revolution Frontier is FDA cleared and expected to deliver better clinical outcomes in liver lesion detection and kidney lesion characterization because of its speed—potentially reducing the need for unnecessary follow-ups, which would benefit patients with compromised renal function, and reducing noninterpretable scans with Gemstone Spectral Imaging Metal Artefact Reduction. AI is gaining interest in the CT community as it adds a new level of data analytics for clinical purposes. "For CT specifically, AI can be used in several areas to improve clinical and operational outcomes," Neufelder says. "For example, in clinical domains, scans reconstructed on the scanner can be quickly analyzed and medical professionals immediately alerted to anomalies that are identified, such as stroke imaging of emergency department patients." Furthermore, task-driven protocol optimization could automatically set optimal scan and postprocessing parameters based on natural language descriptions of a clinical task, anatomy, etc. Nicholson notes that, coming out of RSNA, everyone was talking about AI and machine learning and focused on building tools that can help physicians and end users to significantly improve their workflow, both into the PACS environment and at the CT scanner. On the operational side, AI can be used with sensor-based analytics and data mining from usage profiles and statistics to predictively estimate failure of components so scanners can be proactively serviced to prevent unplanned downtime. "I suspect that software-based learning algorithms will have an immediate impact in areas from diagnosis and dosing to anticipating and preventing system failures," Sheehan says. Looking ahead, Nicholson feels the industry will be talking about getting more out of CT scanner data, whether by improving the resolution of the data at the time of acquisition or using algorithms to pull more information out of those data. 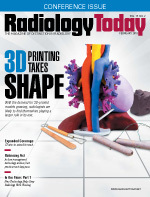 "If you think of the amount of data when you do a CT scan, how large the data set is and how many images you get, I think every vendor and every IT specialist and company out there are working on ways to use machine learning and AI to help radiologists and clinicians make decisions from these large data sets to guide them through their diagnosis," Nicholson says. — Keith Loria is a freelance writer based in Oakton, Virginia.